Arguably the greatest aspect of the independent wrestling scene is one never truly knows what s/he is going to get. Every live event is a literal exploration into the incredible depths of both character development and athletic prowess, with only creativity serving as strings attached. One moment Gary Jay is dropping jaws against an opponent twice his size. Another has Su Yung transforming from Pokemon to zombie bride. Then there’s Zach Sabre and Roddy Strong performing a 45-minute clinic on technical grappling. Thus, when Viking War Party (VWP)’s Jake Parnell reached out to purchase then review their new DVD (‘Wrath of the Norsemen’), I was admittedly intrigued. To explain – and at Wrestling in Florida – we have a specific warm sport for athletes in regional promotions we otherwise might miss. Wrath of the Norsemen is a concise DVD – 6 matches, clocking in at a little over an hour – and follows VWP’s small venue journey from Brooklyn…to Chicago…St. Louis…and even Mexico. Production quality is typical of self-produced, independent wrestling. Some hits, some misses in audio-visuals, but certainly watchable. I was, however, bummed a terrific Mexico match (versus The Hooligans) featured a stationary camera seemingly always in the wrong place. First impressions always make a difference for any pro wrestler aspiring toward biggest horizons. I dig the pseudo-torn look of the DVD cover, Viking themed, hand written DVD label, also included stickers and promo cards. “American Viking” Alexander Rudolph, “The Gordiest Viking” Frank Wyatt and “The Littlest Viking” Jake Parnell certainly know their marketing. I mean that in the best of ways. On to the content. Perhaps the most intriguing part of ‘Wrath of the Norsemen’ are its matches held at training centers…featuring other wrestling talent as spectators. Seeing the natural excitement, watching the chants/interactions, the ‘this is awesome’ and ‘holy shits’…was an anthropological experience for this wrestling fan. Specifically, I was always curious how pro wrestlers envision fan culture alongside versus on receiving ends of the camera. There is an interesting but loving disconnect inherent within this view. I simply adored it. Looking deeper – and akin to Jay, Yung and Sabre/Strong – Viking War Party are likewise doing something very different. This odd trio capably combines a diverse high flyer (Parnell) with a traditional power wrestler (Rudolph) and a gargantuan Wyatt (clocking in at close to 400 pounds, if not more). This trio shouldn’t work, but they do…and to perfection. With every VWP tag comes a new act in a beautifully orchestrated longer play. One can’t help but smile and laugh watching these great performers. Three individuals sporting infectious enthusiasm and fun, aspects which naturally spread to everyone in/out of the ring a few match minutes in. From the get-go, there’s no question it’s a VWP raid based on pre-match carnage. Parnell chews down upon chairs, Rudolph tosses everything in sight, and Wyatt creates a literal warpath on the way to the ring. In-ring work and pacing is exceptional. Here’s where it really gets interesting: VWP manipulate pace using body size; something I can’t recall seeing except in rare instances…and never this well. Think of a hot tag but with different temperatures. This is new ground. This is most noticeable during trio combo and finishes. Technically, VWP is sneaky good. Wyatt is far too big to be that sharp. Rudolph too intense for such style flexibility. Parnell…has a seemingly unlimited repertoire. Ring of Honor’s excellent War Machine of Hanson and Rowe instantly come to mind…but throwing Parnell into the mix opens up an entirely new menu of options. 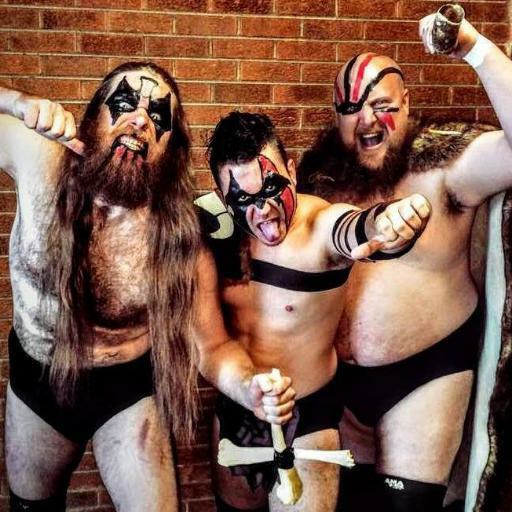 All three members of Viking War Party have been around the indy wrestling block. And it shows. All in all, ‘Wrath of the Norsemen’ is a terrific excuse for any wrestling fan to see something very different. Viking War Party is an exceptional trio, one I hope returns to Tampa soon. Well done, brave chair eaters and tossers. Order it on Facebook here.